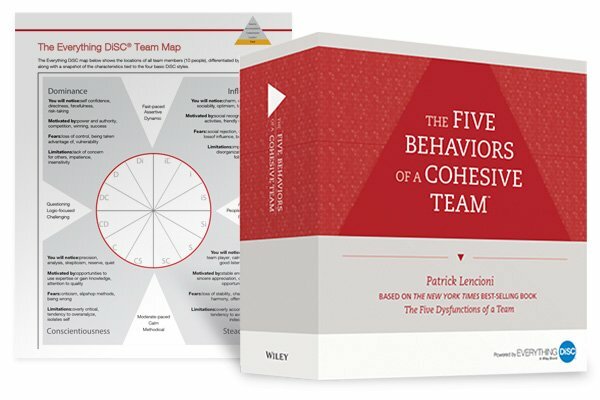 The Five Behaviors of a Cohesive Team™ is designed for intact teams and work groups at all levels of the organization. Each team member receives a link/access code to complete the online assessment. Once everyone completes the assessment, personalized report results are created for everyone. Each person receives a personalized 36-page report showing the team’s results, how to interpret the scores, and individualized personality Type or Style narratives interwoven throughout. Two versions are available at checkout: Powered by Everything DiSC® or All Types™. Please select the quantity of assessments to match the number of team members. This is the number of assessments needed for the team. After checkout, you will be directed to a page to submit additional details regarding the team and a list of members to receive the assessment. If purchasing for more than one team, simply total the number of assessments needed, regardless of the number of teams. After checkout, you will be directed to a page to submit the details for each team.